Hello Frndzzz.... www.dealsnloot.com Back With New Mobikwik CashBack Deal. 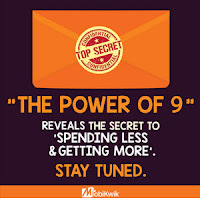 Mobikwik is running Mobikwik The Power of 9 offer. 9 Days. 9 Deals. Just 1 Hour. 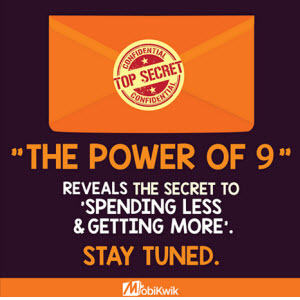 Power of 9 Offer - Flat 25% Cashback on all merchants upto Rs. 100. Offer valid from 13th to 21st Oct 2015. Offer valid only for a one hour everyday. Timing will be comminucated with each offer. The kwikest user who avails all the 9 deals will get a chance to win a G-shock watch worth Rs. 10000. Bill Pay/Recharge Offer - Flat Rs. 100 cashback on Rs. 100 & above on bill payment and recharges for first 100 customers. Offer valid from 7PM to 8PM each day between 13th Oct to 21st Oct 2015.